This Spring we started building a caterpillar tunnel. I thought I’d be posting pictures in early June when it went up. Unfortunately, the tunnel didn’t stay up. So, I kept my pictures to myself. In early August, we rebuilt the tunnel with a few modifications. It’s been standing since. 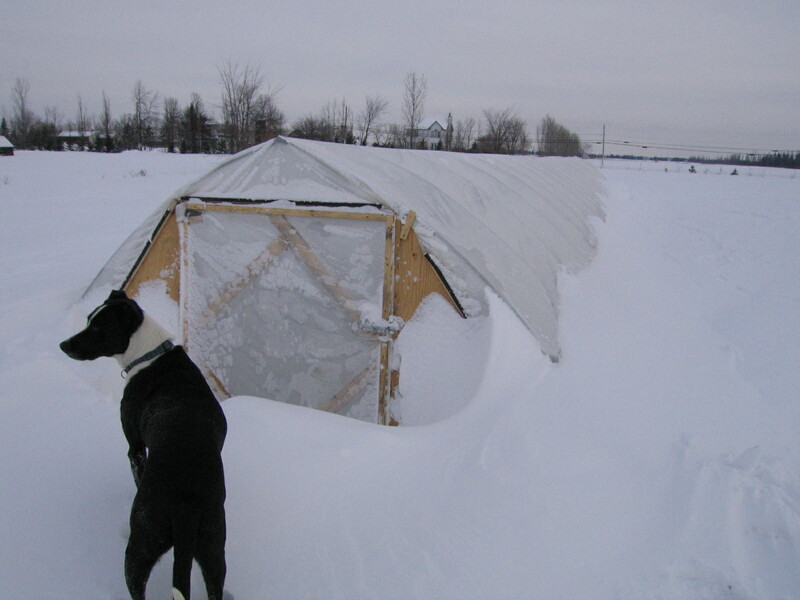 Before posting about our caterpillar tunnel, I thought we could talk about some of the previous tunnel iterations on our farm. Each of the different tunnels we’ve built has improved on each of those targets. 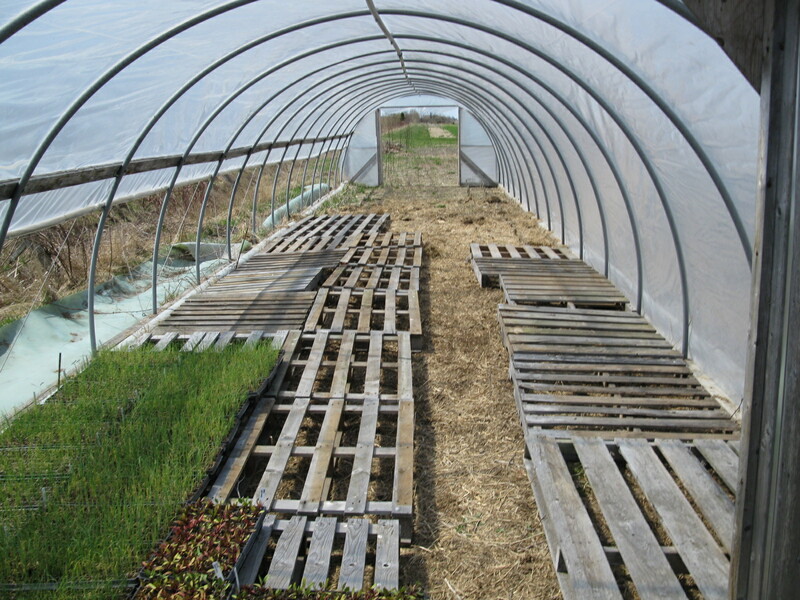 This tunnel is made of PVC arches placed over rebar stakes in the ground. The rebar stakes are actually placed through 4x4s along the side of the tunnel. The endwalls are made of 2x4s with doors attached. We modified Anne and Eric Nordell’s version by adding hip board and roll-up bar on one side of the tunnel. The plastic is attached to the sides by screwing pieces of 1×2 to the 4x4s. One downside of this model is that the PVC arches can’t support our winter snow loads. 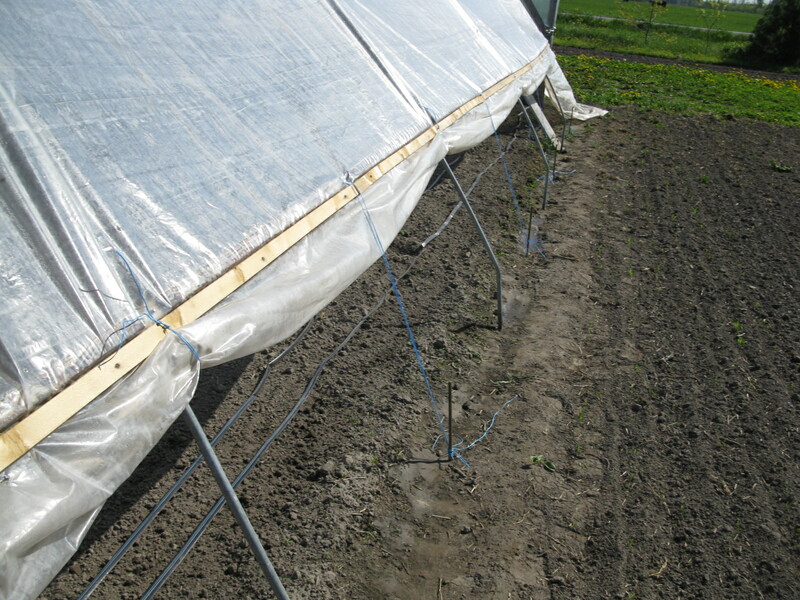 We tie the plastic to the hip board on the left during the winter. 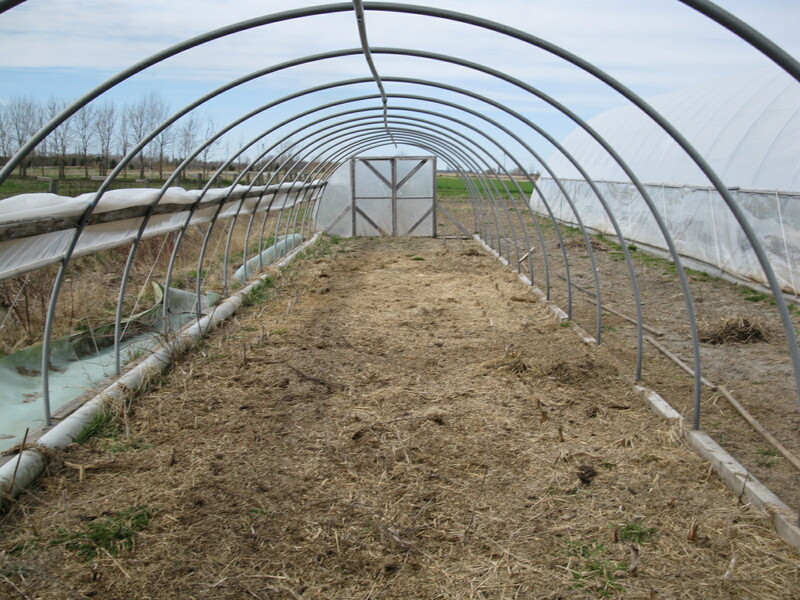 We built this tunnel in our first spring at Tourne-Sol farm. It went up quite quickly and it has never blown away. We’ve moved it once since it was built. These days it is mainly a seedling hardening-off chamber. We built our next variant in the fall of 2007. This model was inspired by Paul and Sandy Arnold’s article on Rodale’s New Farm website. 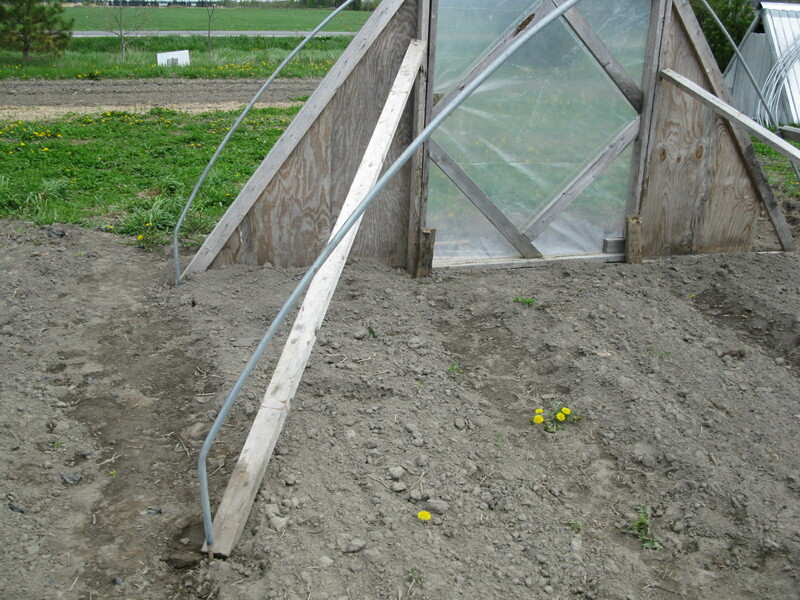 We replaced the PVC arches with steel arches we bent ourselves (more on that in future posts) on 4 foot spacing. The ridge pole is simply duct taped on. We removed the 4x4s. The left side (north) of the plastic is buried. 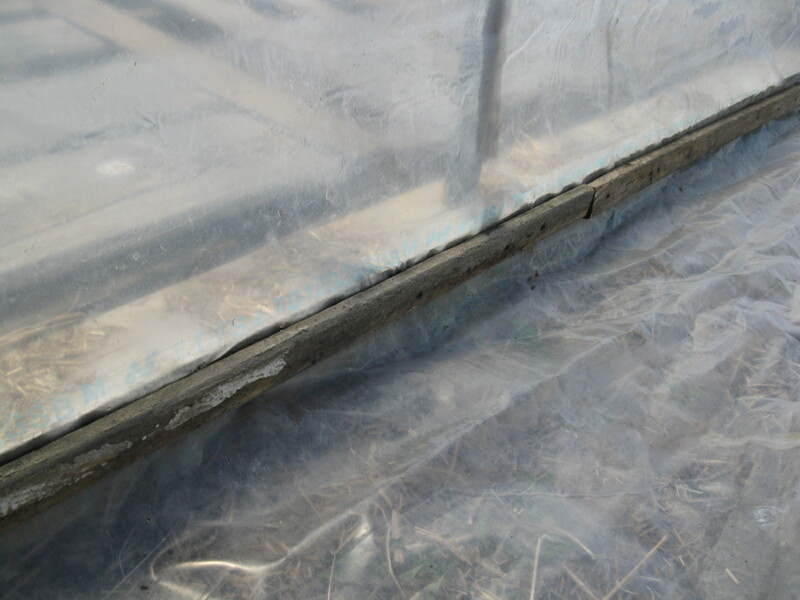 On the south side we kept a hip board to attach the plastic (though we bury it during the winter). We move the tunnel in the spring and again the fall. 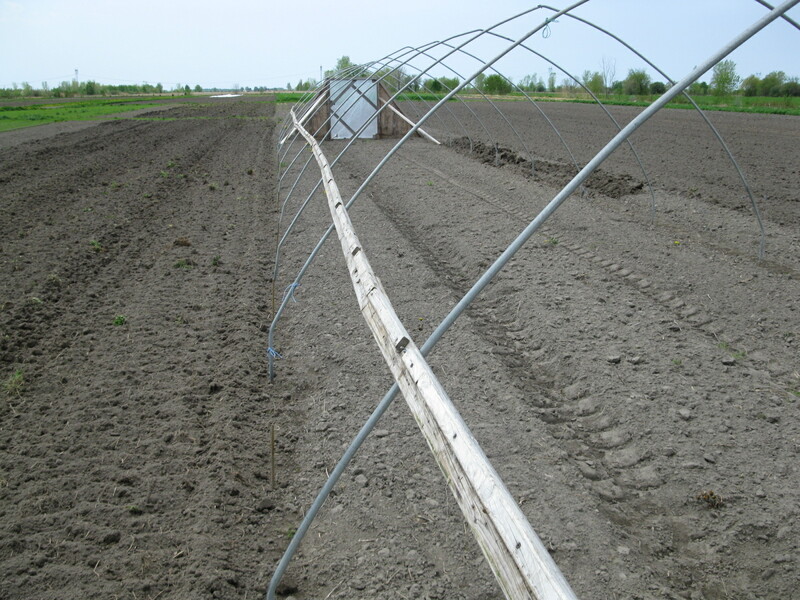 During the summer, arches are spaced 8 feet apart and we don’t put up the ridge pole. We have also simplified the hip board from the PVC design. We simply tie the plastic up rather than roll it up. 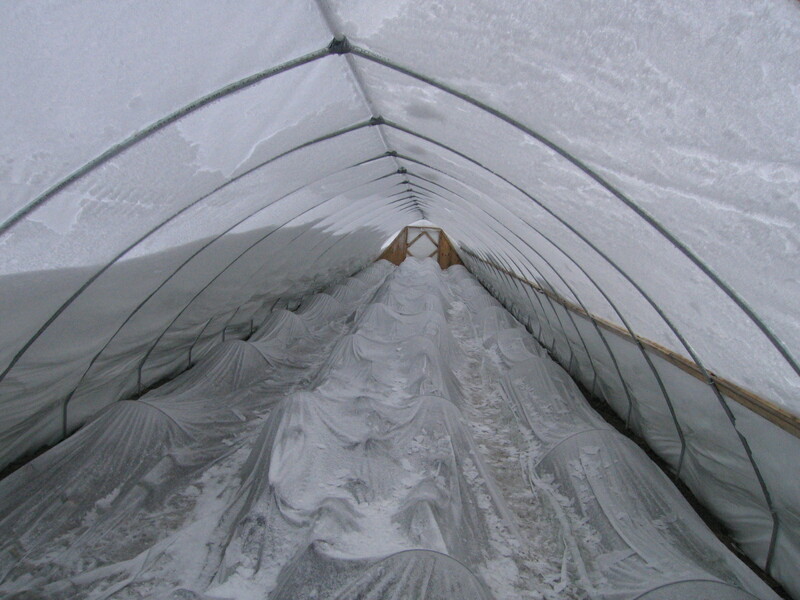 However, the roll up assembly on the PVC tunnel also anchored the plastic to the structure. In this new iteration the hip board is only held on with u-bolts. One strong wind, we discovered this tunnel wasn’t solidly anchored to the ground. So, we anchored the hip board to rebar stakes using multiple strands of baler twine. We also added diagonal braces to the end wall. We have been very happy with this tunnel. 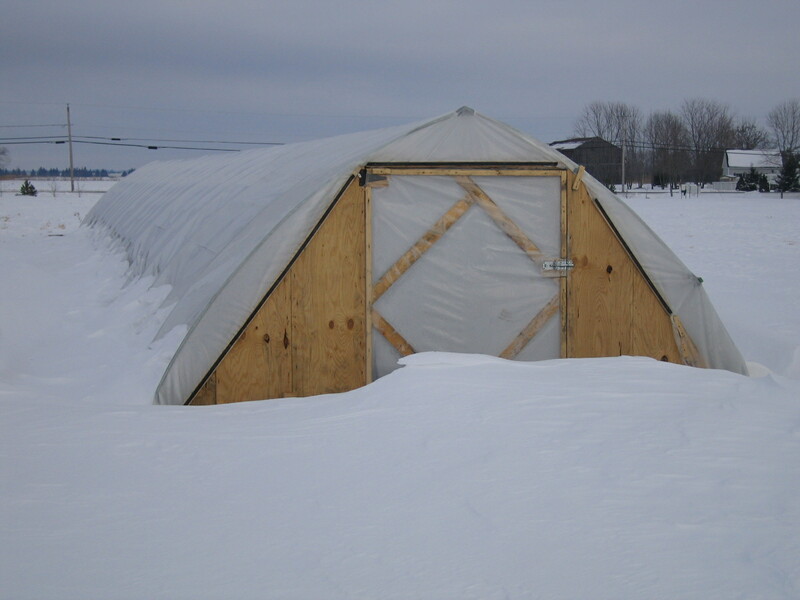 We’ve moved it twice a year for the last 3 years and have successfully overwintered crops despite some very heavy snow. However, we thought we could make this tunnel even easier to move by reducing or eliminating both the end walls and the hip board. Catterpillar tunnels were the next variation to try. Click here to see the next tunnel post. Saving Big Loads of Tomato Seed!